Aug 30, 2015 • The 2.38 million Landsat images freely downloaded in 2011, benefited the U.S. economy by $1.8 billion found a new study published this month by a team of economists from Colorado State University and the USGS Fort Collins Science Center. To valuate Landsat data, the team of economists turned to a technique known as the Contingent Valuation Method, or CVM. The U.S. Office of Management and Budget recommends this method for benefit calculations in cost-benefit analyses. The CVM technique can capture users’ willingness-to-pay for non-market goods or services. Landsat, like many government-provided geospatial data sets, is considered a public good (like census data and topographic maps). While you could think of a public good as something that does the public good, a proper definition of a public good is a commodity that is not diminished or consumed by use and that after being provided the first time, costs nothing (or little) to provide to additional users. For this study, the economists surveyed the 44,731 data users registered with the USGS. Their response rate was 30 percent, so they had a sample size of 13,473 data users. The numbers that came out of this survey were: a mean value for established U.S. users of $912/scene and $367/scene for new and returning U.S. data users. However, these means were skewed upwards by the 5.5 percent of users who were willing to pay $5,000 or more per scene, making the median willingness-to-pay for U.S. users more reliable ($182/scene for established users and $49/scene for new and returning data users). Academic users valued the data lowest and non-government-agencies valued the data highest. 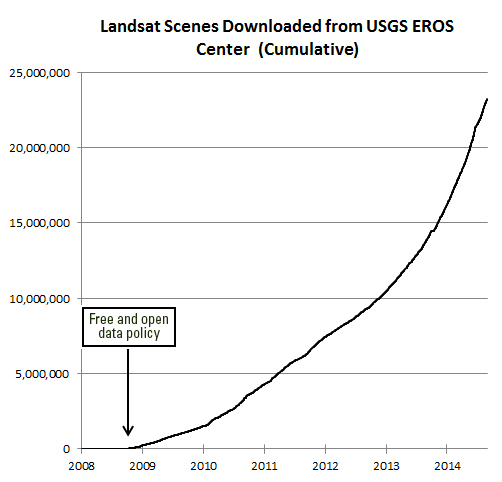 Worldwide (for both U.S. and international data users) the annual economic benefit for the Landsat scenes obtained in 2011 was calculated to be $2.19 billion. This estimate was considered to be conservative because it did not take into account any downstream users of Landsat data, i.e. those data users that did not directly download Landsat data from USGS. For the U.S., the annual economic benefit for 2011 was $1.8 billion—an amount, the authors point out, almost double the cost of Landsat 8 (build+launch). “From a valuation standpoint, Landsat is an extremely valuable public good just in its direct use—let alone the economic value of all the indirect uses built on the direct data,” said John Loomis, an economist at Colorado State University and the study’s lead author. 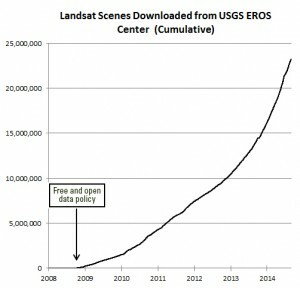 The study concludes that a large portion of Landsat’s value comes from the free and open data policy that gives users copious amounts of no-cost data, and that charging even small amounts for data would dramatically reduce the number of data users and thereby its benefits to the economy.